The long wait will finally be over as we will be going to Zurich this May! 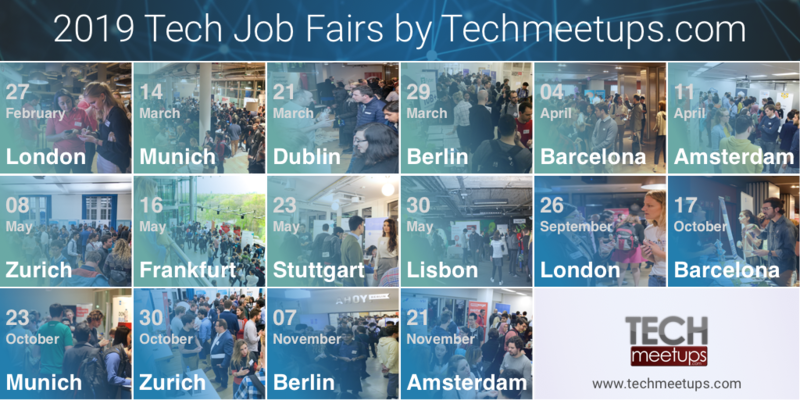 If you are still searching for job opportunities, you might be interested to join our Tech Job Fair on the 8th of May in Zurich. This is your chance to meet different employers in person and showcase your skills and talents. Here is the list of companies that will join us in this event. Prepare your CVs now as these companies are excited to see and hear from you. Don't forget to grab your tickets here! ELCA offers expert services from a single source for the entire life cycle of IT or digitization project: from the definition of the IT digitization strategy for your company over the implementation of complex IT solutions to managed services during the operating phase. They always offer the best consulting, development, integration and managed services to successfully implement your project. Avaloq is a leader in core banking software, digital banking and digital wealth management. They're always looking ahead, always improving, building on a flexible modular approach. They are the Fintech leader in digital banking and digital wealth management. Leica Geosystems creates complete solutions for professionals around the world. Their success is driven by 4,500 employees in 33 countries. Staying close to the markets they serve is their key to being responsive to the needs of their customer. DXC.technology is the world's leading independent, end-to-end IT services company. They lead the digital transformations for clients by modernizing and integrating their mainstream IT, and by deploying digital solutions at scale to produce better business outcomes. The company’s technology independence, global talent, and extensive partner network enable 6,000 private and public-sector clients in 70 countries to thrive on change. This is where ambition, freedom, and responsibility come together – where talents grow and happiness thrives. Frontify provides a convenient cloud-software to create professional Style Guides, collaborate visually, and improve the web design-to-development workflow. They maximize the brand's value with a customizable brand management suite. Auterion enables new business by creating better technology the open source way, and by connecting the community of developers, contributors and companies. In 2008, their founder created PX4 and Pixhawk, the most widely adopted permissive open source projects in the drone industry. Now, they are the largest contributor to PX4 and the software platform powers consumer, commercial and industrial drones of every type, from multicopters to VTOLs. Tundra is a commerce platform born from this spirit. They use technology and their deep expertise in logistics to automate every aspect of wholesale ordering. They are built on the concept of True Trade - that buying and selling should be Direct, Free and Worldwide. They are passionate about enabling businesses around the world to buy and sell amazing products instantly and online with freight included. Net 60 payment terms, simple checkout and easy delivery. Wingtra develops, produces and commercialize drones that combine the ease of use of agile multicopters with the long range of high endurance fixed-wing aircraft. Their drone "WingtraOne" carries the best in class sensors that collect survey-grade aerial data. They are the world’s leading VTOL drone producer, headquartered in Switzerland. Verity Studios are transforming the live event experience. They make the magic real, the extraordinary. With heads full of ideas and their feet firmly on the ground. Verity has a passion for bringing technology and the arts together to create something people have never seen before. But more than that, they believe it should be contained in a system that’s easy to use in any event. The Sunflower system senses when people, animals, or cars come and go from your property. A network of sophisticated motion and vibration sensors make it possible to identify each type of activity. When something moves across your property, the Sunflower system tracks and categorizes it. They combine Swiss craftsmanship and engineering with Silicon Valley startup culture. Nanos is a Swiss startup, based in beautiful Zurich, composed of a dynamic and fast-growing team of machine learning specialists, engineers and designers. They believe that online advertising should be accessible to everyone. They work in close collaboration with the Computer Science Department of the Federal Institute of Technology/ETH in Zurich. TieTalent believes in changing the game in the staffing industry by making recruitment simple. They want to make things simple, efficient and fun which is why they reworked the essence of the recruitment process and stand by a mission that they are passionate about. They make recruitment simple! HR Campus makes people happier and businesses more successful with practical HR services, intelligent software products and holistic strategies. They use holistic solutions to simplify the daily lives of HR managers. They are lateral thinkers by nature. Unconventional, bold ideas inspire their creativity and pave the way for fresh digital solutions. VISIONAPARTMENTS specialises in developing and renting premium furnished apartments with service and style. Through their stylish offer, passion and focus on providing excellent service - they bring fun and enjoyment to the lives of their clients and employees. Siemens is a global powerhouse focusing on the areas of electrification, automation and digitalization. They are the leading supplier of systems for power generation and transmission as well as medical diagnosis. In fiscal 2018, which ended on September 30, 2018, Siemens generated revenue of €83.0 billion and net income of €6.1 billion, and as of September 30, 2018, Siemens had around 379,000 employees. All of these companies are looking for motivated and passionate individuals to join their team. They can't wait to have you. 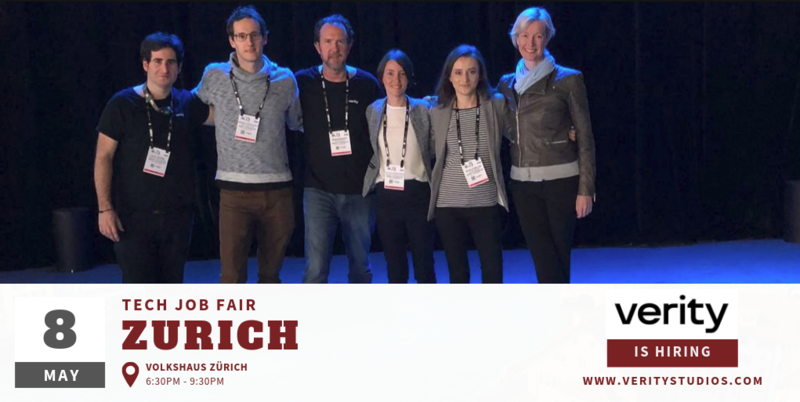 Meet them on the 8th of May at our Zurich Tech Job Fair! Get your tickets here and join us in Zurich! You are in good hands with us – as our high positions in various rankings and benchmark analyses testify. According to the careers studies undertaken by trendence, we have repeatedly been confirmed as one of the top employers in Germany and Europe in the categories of “Graduate Barometer”, “Young Professional Barometer” and “Student Barometer”. We also scored well in the “Universum Survey”. In 2016, we were again amongst the top 100 employers. Prizes and certificates may be nice to have – but what really matters to us is the goal itself: we know that success is founded on the efforts of our employees. To continue writing this success story, we afford our employees the greatest freedom of expression, attractive prospects and potential to advance their careers. We enjoy making this investment – and it pays off for us all. On whichever level you start – with us you will be part of one of Europe’s most innovative media corporations. Take a look at our wide-ranging portfolio and you will soon realize that there is no shortage of interesting links: from SAT.1, ProSieben, kabeleins, sixx, SAT.1 Gold, ProSieben MAXX and kabel eins doku, the TV stations, via ProSiebenSat.1 Networld to maxdome, Germany’s biggest online video store and ProSiebenSat.1 Games with platforms likealaplaya, ProSiebenGames, Sat1Spiele and browsergames. You will see that our environment fosters creativity and demands innovative ideas. True to our motto “we think ahead, whilst others are lost in thought” we seek out personalities with a strong desire to create, ambitious and courageous enough to be in the vanguard always. Each year we bestow the "Allstars Award" on employees for special achievements. Martin Martin (form. Krautsieder) was one of the recipients in 2013. He developed a market research tool which enables questions to be put to viewers directly via television. "Yes we care" – a slogan with real meaning at ProSiebenSat.1. Our careful balance between professional and private life is maintained through flexible models of work and dedicated support services. We have among others our own day care centre and a broad sports programme. In the case of special help being required in organizing daily life, we call on pme Familienservice, a specialist provider of care solutions for work and family. We love dynamic change – and your further development is especially important to us. The ProSiebenSat.1 Academy offers a varied, innovative programme of further education and training. Additional support comes in the form of talent and newcomer monitoring, helping to plan your individual short-term, mid- and long-term development within the company. Diversity is the order of the day at ProSiebenSat.1 – and that goes for our staff too. Indeed, it is the diverse mix of personalities which makes us what we are: “Fascinating People" whose ideas, different perspectives and experiences entertain millions of people every day. We believe that the future success of a modern company will largely depend on how it promotes and utilizes diversity. One important point in this regard is the ratio of men to women in the company and in management roles. We have already achieved good results in this area: male and female full-time employees are almost equal in number. 30 per cent female representation at management level is also well above average. Colleagues from a wealth of different nations work for us and we are unequivocally in favour of every form of diversity. We are not just entertainers: Thanks to our popularity we are fortunate to be in a position to interest young people in particular in important social topics: we want to create opportunities, promote culture, communicate values and build knowledge. Within these four areas we have established a range of projects and activities to make our contribution as a media corporation to Corporate Social Responsibility. Our latest jobs | Find the perfect job for your on our job portal. Are you up for a unique challenge, with a chance to use your skills in a fast paced environment, where you work hard, wear many hats, and commit all your energy to an idea that has only a one out of four chance of success? If so, then working at a startup company may be for you! What makes an awesome startup employee? You hear people talking about what makes a great startup founder all the time: A great sense of vision, clarity of purpose, relentless drive, a strange balance of over-confidence and insecurity. There are whole books written about it. But what makes a great startup team-member? The people who join and thrive in early start startup teams are an equally special breed. In fact, the best startup employees aren’t necessarily the best fit for working in more established businesses – some of the most brilliant startup people I’ve worked with find the traditional business work impossibly frustrating. Passion, enthusiasm, motivation for what you’re doing – Must buy into your vision and your big “Why” – what it is you’re trying to do or create in the world. They’ve gotta care about the problem you’re trying to solve, otherwise it’ll be hard to stay motivated. Curiosity – They’ve got to love the process of finding better ways to do things – especially when it comes to challenging assumptions about the only way to build products. Being curious about why you’re doing this, who it’s for and how they’re going to use it is vital across all roles in a startup too. Pace – They’ve got to be great at making decisions and acting on them quickly. The old adage of succeed quickly or fail fast is the day to day life of a start up. You need people who thrive and are excited by this. Grit – /resilience – your resilience will be consistently tested and challenged in a startup. That thing you just spent a month working on? It’s not working, we need to abandon it and try something else. The reality is that it will not be a smooth ride. People who have made it through a few tough life experiences, who have demonstrated Grit, are more likely to survive. Hunger and willingness to sacrifice – Founding a startup requires sacrifice. So does working in one. You’re going to get chucked in the deep end often. You’re going to be asked to work longer hours, more often. It’s a high pressure job so you’ve got to be hungry and prepared to make sacrifices. Sense Of Humour – You’ve got to be able to laugh and realise that tomorrow is another day. The sun will set, the sun will rise. Late nights, too much pizza and endless bug squashing is only bearable if it’s also fun. You want to be able to laugh with the people you sit next to. Flexibility – The only constant is change. Get ready to develop skills you don’t have. Although you may be employed for a specific role, the nature of start up means that everyone leans in the direction that the business needs to be focused on at that time. If its sales this month – then get ready to help out in that area. Anyone who defaults to “that’s not in my job description” isn’t suited to a startup life. Delivering Startup Happines | We help Startups through Events like Meetups, Workshops, Hackathons, Job Fairs, Events Promo and also have a job posting site www.techstartupjobs.com to help you recruit your team. When you're job searching, take some time to attend job fairs. You'll have the opportunity to meet with employers that you might not be able to access any other way. Plus, job fairs and career expos often offer networking programs, resume reviews, and workshops for job seekers. What can you do to compete with the crowds attending job fairs? These tips will help you get ready to attend and maximize your opportunities while you're there. Dress for Success. Attend the job fair dressed for success in professional interview attire, and carry a portfolio. However, do wear comfortable shoes, because you will be standing in line. Practice a Pitch. Practice a quick pitch summarizing your skills and experience so you're ready to promote your candidacy to prospective employers. Bring Supplies. Bring extra copies of your resume, pens, a notepad, and business cards with your name, your email address, and cell phone number. You might also want to consider bringing "mini resume" cards as an efficient way to sum up your candidacy. Check Out Companies. Many job fairs and career expos have information on participating companies on the job fair web site. Be prepared to talk to hiring managers by checking out the company's web site, mission, open positions, and general information before you go. If you demonstrate knowledge about each company or manager you're talking to, you'll certainly stand out from the crowd. Arrive Early. Keep in mind that lines can be long, so arrive early - before the fair officially opens. Attend a Workshop. If the job fair has workshops or seminars, attend them. In addition to getting job search advice, you'll have more opportunities to network. Network. While you are waiting in line, talk to others. You never know who might be able to help with your job search. Along the same lines, remember to stay polite and professional. Even if you're feeling discouraged in your job search, don't vent to other fair-goers about your situation or about any specific companies. Stay positive and make the most of the opportunity! Show Initiative. Shake hands and introduce yourself to recruiters when you reach the table. Demonstrate your interest in the company and their job opportunities. Be Enthusiastic. Employer surveys identify one of the most important personal attributes candidates can bring to a new position as enthusiasm. This means that employers want to see you smile! Ask Questions. Have some questions ready for the company representatives. The more you engage them, the better impression you'll make. Collect Business Cards. Collect business cards, so you have the contact information for the people you have spoken with. Take Notes. It's hard to keep track when you're meeting with multiple employers in a busy environment. Jot down notes on the back of the business cards you have collected or on your notepad, so you have a reminder of who you spoke to about what. Say Thank You. Take the time to send a brief follow up thank you note or email to the company representatives you met at the job fair. It's a good way to reiterate your interest in the company and to remind company representatives that you're a strong candidate. The Noo Group Ltd. (‘Noo’), a creative startup in New York, is redefining New Year’s with Noo Year’s once again by hosting The Digital Party, an original, animated fundraiser to help give people in developing countries clean water to start the new year. You’re invited! “Some people run together to raise awareness and solicit donations, others swim together. I decided our effort for this cause would be to create something together. So we’re creating a special party that anyone can attend to support the cause”, says Mahdad Taheri, Noo’s Founder. The startup is asking event organizers and website visitors to Give Water right up to the final minute on New Year’s Eve, by donating at http://www.mycharitywater.org/noo2012 to raise $20,000 for charity: water, a non-profit organization in New York on a mission to give almost 1 billion people in the world access to clean water. Donations are 100% tax deductible. Many view New Year’s Eve as a reason to party hard and wake up January 1st wondering what happened the night before. Taheri says, “the start of a New Year shouldn’t just be about dancing ‘til the ball drops but also about celebrating positive change in each other’s lives.” To bring this idea to life, Taheri aligned with charity: water to celebrate positive change in other people’s lives with something we often take for granted in the developed world – clean water. Harnessing the power of social media to do social good, Noo’s all inclusive party invites everyone to join by donating to the campaign or by spreading its message – Give Water New Year’s Eve – the night the campaign ends. “I strongly believe our generation is going to leave its mark in the universe not simply by being more connected than past generations, but by using our creativity together to solve big problems that past generations could not come together to do,” says Taheri. The $20,000 raised through Noo’s campaign will go towards the purchase of a drilling rig, which will help bring clean and safe drinking water to 40,000 people in northern Ethiopia each year. charity: water will track the rig with GPS technology so donors can follow its progress for years to come. Comments Off on Technology 200: Mobile, Interactive Marketing, and Crowdsourcing. Oh My! Technology 200: Mobile, Interactive Marketing, and Crowdsourcing. Oh My! The startup space is getting more and more crowded with companies that want to skyrocket to fame and riches, but only a handful actually get there. Each year, Lead411, an information services company, hosts theTechnology 200, a list focused on the top revenue-producing startups in technology. The list is ranked based on the highest percentage revenue growth from 2008 to 2010. More than 600 companies applied, all of whom are based in the United States, are private, and earned over $500,000 in revenues in the year 2010. The list is getting tighter. Initially, it focused on 500 of the top growing startups, but the company wanted to hone in on the cream of the crop, so it whittled the list down to 200, says Tom Blue, founder of Lead411 and the Technology 500. The top ranking company on the Tech 200 is inStream Media, a company that connects brands with consumers through multi-channel marketing programs. The company experienced 3,509% growth over the past two years, and brought in $3.6 million in sales in 2010. The Russian startup scene took another step towards becoming an international platform last week with the launch of TexDrive, Moscow’s first international mentor-led startup accelerator program. The 12-week TexDrive accelerator program for entrepreneurs aims to “build businesses that are efficient, attractive to investors and have global ambitions” with the help of Russian and foreign experts and mentors. The accelerator promises to provide startups with international experience and connections “from over 250,000 contacts,” through its office in Moscow as well as with paid or pro-bono support from a range of partners. I recently attended the O’Reilly Strata conference in New York which was themed “the business of data”. It was an incredibly inspirational week focused on the way big data is changing our world. I was most impressed by the variety of professions and activities that were represented in both speakers and attendees—scientists, government officials, software developers, marketers, designers, and infrastructure professionals. During the conference I saw firsthand the huge opportunities in “making data work” and creating value by using data more creatively and effectively. Data provides a competitive advantage – Many presenters demonstrated that data is immensely effective for improving people’s lives, developing new products, and reinventing existing offerings. Unfortunately, where there is profit, abuse often follows—there is a thriving business in illegal data. Data Science is a new, old profession – Although “data science” is all the rage now, it’s been around as long as data has been recorded and analyzed. The difference today, of course, is that the amount of data thrown off from on-line and real-world activities is so massive because of our hybrid real/virtual world. Software tools and infrastructure, many of which were highlighted during the week, are becoming more and more powerful and can assist in finding patterns and drawing conclusions. Everything seems to be in the cloud nowadays. From your OS to your Database to your Dev platform to your most loved App. Everything seems to be using the Cloud in an innovative way to provide you a seamless user experience. Gartner announced ‘Cloud computing’ as No 1 in its list of Top 10 Strategic technologies for 2011. If you are interested in Cloud computing or developing a Cloud Solution that you would like to present – The TechMeetups Sep Cloud Computing Event ‘Cloud Base’ is the place to be. This will be held on 8th Sep at Hackney Community College. Based just off ‘Silicon Roundabout’, Jeffreys Henry is a top 100 firm of Chartered Accountants with extensive knowledge of the technology sector. Over the years they have worked with entrepreneurs with a great idea to companies from Silicon Valley entering the UK such as Bebo, Smarta, dotDigital, Ticket Tailor and Flup.